A ginger bug is a culture made with ginger, sugar, and water used in making fermented beverages such as homemade sodas, ginger beer, carbonated fruit juices and teas – a.k.a. ginger bug soda. In baking recipes, it can be used to replace whey; and in bread as a natural leavening agent. Similar in nature and care to a sourdough starter, it is fed for a few days to begin the culture. Once bubbles are noticed on the top and/or sides of the culture, it is ready to use. The culture can be kept going indefinitely by feeding daily, or once established, stored in the fridge and fed weekly. I only say weekly as a precaution. I’ve been known to leave my little bug in the fridge for months without any feedings and it bounced right back. It is a well established ginger bug, I’ve kept it alive for 3 or 4 years now, and it doesn’t seem to mind waiting to eat. Ginger peel has a fair amount of natural yeasts to work with. Turmeric is another popular choice (if you can find turmeric root) but rumored to be more delicate natured than a ginger bug — you can also experiment with “fruit bugs” or “vegetable bugs”. My favorite use for my ginger bug is as a carbonated soda base. A naturally fermented drink is rich in probiotics and enzymes, and homemade sodas not only taste wonderful, but are infinitely healthier than store bought. Any flavor combination you dream up can be used with your ginger bug base to make an all natural, healthy, carbonated soda drink. Once you’ve tried it out, you’ll probably come up with a few favorites! They can be stored in a cupboard or the fridge once bottled, and if you happen to have a cola addiction – having a pantry stocked with healthy alternatives is a great way to wean yourself off them! 2 cups water – dechlorinate if you like, I use water straight from the tap with no issues, but chlorine levels from town to town can vary vastly. 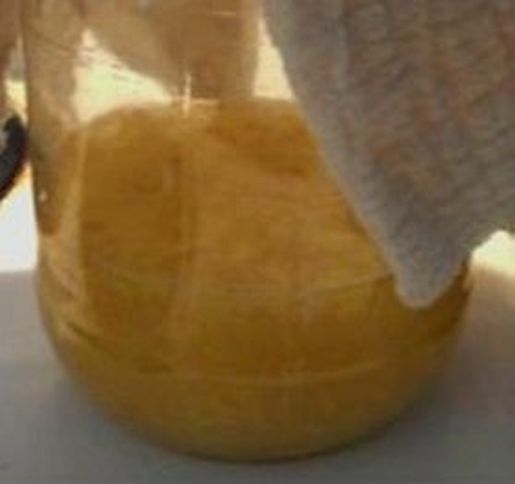 Add your grated ginger, sugar and water to a sterilized jar. Cover using several layers of cheesecloth held on with an elastic band and leave at room temperature. Mix ginger bug twice a day using a non reactive utensil (wood, plastic, glass, or stainless steel). If the jar gets over-crowded with ginger, you can add an equal amount of water, but otherwise it isn’t necessary. After a few days (usually somewhere around 6 – 8 days) you will notice tiny bubbles along the edges and/or on top. Your ‘bug’ is now ready to use! Don’t worry if the bubbles are not ginormous. Teeny weeny bubbles are just fine! Use about 1/4 cup of your bug as a starter per quart of whatever you are brewing, or 1 cup per gallon. Begin by straining the desired amount of liquid into a measuring cup. Return the pulp to your ‘bug’. Replace the liquid you used with an equal amount of water, and feed your bug. Recolonize your bug with daily feedings, it should be ready to use or store again in about 2 days. When your bug is bubbly again, either continue daily feedings, or store in the fridge with a tight lid. Once every week or so, feed your ginger bug before returning to cold storage. When I am ready to make more ginger bug soda, I remove the bug from the fridge and strain out what I need. Then I feed my bug and leave it on the counter 1 or 2 days for daily feedings (until bubbly). I find that after i use the ginger bug, it doesn’t refresh. I added water to replace the liquid i used and i fed it as i usually do. I have to keep making new bugs after each batch. Any idea why it is doing this? When you refresh you are adding a fair amount of water all at once, so it may take a couple days to get bubbly again. Leave it on the counter, replace the water and feed daily. Once you see some action, you can cap it and store in the fridge again – and remember it won’t necessarily but tons of huge bubbles. Mine normally only has a row of tiny bubbles around the top of the liquid and makes great bubbly sodas. How much liquid is normally in your starter? I keep mine at approx. 2 cups water, and use 1/2 – 1 cup at a time when making soda, so I’m replacing up to half the liquid. If you are using the majority of the bug and replacing almost ALL the liquid it will take longer to refresh since you’d be upsetting the ratio (balance) of yeasts. Ok if you keep leaving the ginger in the bug has won’t it ultimately fill the whole jar? When you eventually have too much ginger in the bug, it can be strained out and then feed the bug as usual. The strained out ginger can be added to baked goods, or dehydrated and ground to be used as a spice.